Do you have an iron in the house? Do you use it? Ironing is becoming a lost art. With all the modern fabrics, most garments no longer need pressed if they are washed and dried properly. I've also noticed that standards have changed and it is not always improper to wear something wrinkled! Oh dear! I have many wonderful memories which involved ironing. I can remember a toy iron that really worked when plugged into a wall. It would become slightly warm and my sister and I would iron doll clothes and hankies on a toy ironing board. Such a toy would be considered a danger to a child these days, after all, it required the ability to plug something into an outlet! But, we used it safely and it provided us with many moments of make-believe fun. As they say, play is a child's work. Some of my first memories of grown-up ironing when I was about ten or twelve years old. A family friend had a baby daughter who had the cutest of clothes! I remember ironing her little dresses "just for fun". As I grew older, ironing became the chore that allowed us to watch television. Being a productive family, it was expected that we be busy working on something if the television was on. I remember ironing many pillow cases and my dad's shirts while watching the Patty Duke Show, Gilligan's Island, The Beverly Hillbillies, or The Lucy Show. Do you remember them? These days my iron is used for touching up garments when getting dressed up. A suit, skirt, or shirt sometimes needs a little crispness added. But, it's used most frequently for pressing fabrics when sewing a quilt or other sewing projects. Times change, but memories remain. Sometimes it is good when household objects become obsolete, as it signals an improvement and new technology. But, when such objects become obsolete, there is something that is left behind. My children do not have the pleasant memories of ironing that I did as a child. I believe that it's their loss. I have many memories of my mother ironing when I was a child. I also remember an "ironing lady" in town who ironed garments for 10 cents each. I remember all the same things you do with regard to ironing with the exception of ironing baby dresses. My ironing was limited to pillow cases, which were always ironed and doilies. I have a turquoise and pink iron right now from childhood. It's in my laundry room...the one decoration. Ha! I see that Dawn at The Feathered Nest has a new iron today. I need a new iron for the same reasons you do and I am tired of the old one that leaks at the worst possible times. I remember ironing a lot when my husband was still in the Army Reserves, no wrinkles allowed on those uniforms! These days my ironing board has been in the garage, waiting to be used again. I'm planning a few sewing projects but I haven't told it, yet. I don't want it to get too excited with anticipation. laughing a bit, as really my iron and I have no relationship. i do use it occasionally in sewing (when I am not rushing), but other than that, we remain strangers. I don't like cleaning my house, but I still love to iron. Wonder if that is why I collect vintage linens so I can iron. Of course I iron my jeans and t-shirts too. What can I say, I enjoy doing it. One summer when I was in high school the doctor's family that delivered me when I was born hired me to clean their house. I would iron all the doctor's shirts. Their young daughter would try to sneak up behind me when I had the iron in my hand and pull down my pants. Oh dear, I definitely had to be quick and on my toes. Still I enjoyed the times of ironing the shirts and listening to the beautiful music they played. A fond memory. I do have an old, green metal, toy iron, but I don't think it was one that plugged in. At least there is no longer a cord attached. Yes, I iron often. I love to make cotton skirts, and they require ironing for me to feel put together. I enjoy this task! We do have an iron but I mostly use it for tablecloths and hubby's dress shirts. When I was young the iron and I had a very nasty encounter and I have scars on my hand from it. I shied away from an iron for many years. Yes! I love to iron!!! Nothing like seeing the fabric smooth out right before your eyes! I have very clear childhood memories of my mom and the sprinkle bottle and the big pile of ironing to do. I had my own little iron and ironing board set up near hers and would iron all of my dad's handkerchiefs for her! Ahhhh sweet memories! 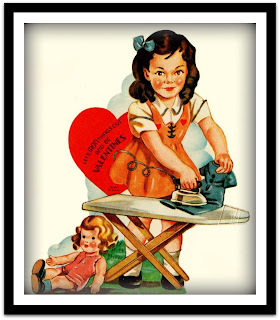 Fun blog and I iron only if I have too...except vintage linens.